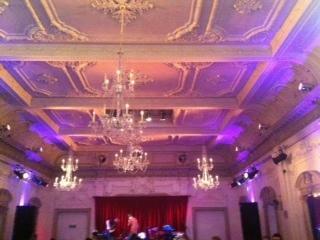 We recently had the good fortune to be at Bush Hall, one of the lovely venues on our site. As you can imagine we don't get the chance to see inside all the venues we have listed with us, so it's always a treat to visit one of them. This time we happened to be there to see Roddy Frame playing live (he was amazing!) but what struck us was how perfect this venue is for a wedding, especially if you have a live band playing. It's worth mentioning that if you do have you wedding here you will be walking in the hallowed footsteps of people like Amy Winehouse, Lily Allen, Florence and the Machine, The Pierces, Imelda May, Suede and REM who have all played here in the past!